What with Radiohead single-handedly changing the face of music distribution and preparing to embark on a massive world tour to promote latest album In Rainbows, it´s pleasantly surprising to hear that they´ve still got time for a spot of instrument swapping. 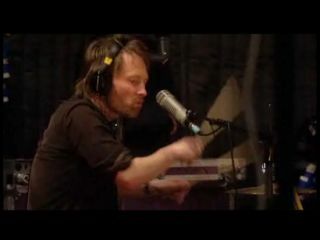 Radiohead recently performed Bangers ‘n Mash for Pitchfork.tv with frontman Thom Yorke on drums. The performance took place in producer Nigel Godrich´s basement studio with the full band line-up in attendance. Thom Yorke didn´t replace usual drummer Phil Selway but instead played a second kit while singing. It´s not the first time either. During the Kid A and Amnesiac album sessions the whole band experimented with different instruments with Yorke playing both drums and bass guitar. You can also watch Thom Yorke banging the drums on the aforementioned track live in San Diego. Dave Grohl with QOTSA and Foo Fighters, Phil Collins, Karen Carpenter and The Eagles' Don Henley are all well known for drumming.